Challenge your limits with Polar Vantage M, an all-round multisport & running GPS watch for anyone who loves setting new records. This slim and lightweight training companion provides you with all the data you need to improve your performance. Polar Vantage M is a combination of the latest sports technology and lightweight design. The new Polar Precision Prime™ sensor fusion technology makes sure Polar Vantage M monitors your heart rate from the wrist accurately even when the going gets tough. Match your Polar Vantage M to any look with a changeable wristband. Choose your favorite from Polar’s selection or use any band with 22 mm spring bars. Whether you’re aiming to improve in your favorite sport or love to measure your performance in different sports, Polar Vantage M is always ready to help you. Polar Vantage M helps you quantify your training and see how your workouts strain your body in different ways. 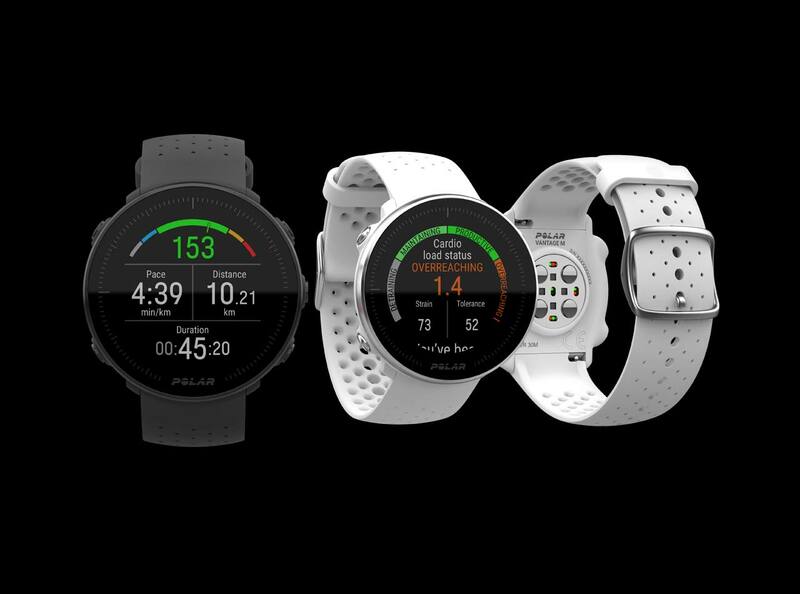 With Polar Vantage M you can customise individual settings for each of your sports. Polar Vantage M works seamlessly with Polar Flow, the online window to your training, sleep and activity. With Polar Flow all your training data is easily available in one place. You can also sync your data to other online sports communities, such as Strava or TrainingPeaks. You get an automatic training diary, extensive planning and analysis tools, progress reports and the support of the Polar Flow community. Give your coach access to your training data with the free Polar Flow for Coach service. Get accurate wrist-based heart rate tracking even in the most demanding conditions. Quantify the strain of your training session and see how your training strains your body. Polar Vantage M supports over 130 different sports. Add your favorite sports to your Polar Vantage M in Polar Flow. Follow your progress in the pool. Polar Vantage M automatically detects your heart rate, swimming style, distance, pace, strokes and rest times. Distance and strokes get tracked also in open water swimming. Polar Vantage M tracks steps, distance, calories and sleep and gives you a personalised activity goal for each day. Find out your running VO2max and follow how your running performance is developing. Get a personal and adaptive training plan that fits you and your goals. Know exactly how many calories you’ve burned based on your weight, height, age, gender, your individual maximum heart rate (HRmax) and how hard you’re training. Get motivating feedback immediately after training describing the effect of the session. Get a comprehensive view on how your heart behaves during your day. Continuous heart rate monitoring gives you even more accurate calorie burn and activity data and tells you the lowest and highest heart rate of your day. Sleeping well will help boost your recovery and performance. Polar Sleep Plus™ automatically detects the timing, amount, and quality of your sleep.